The holy Janmashtami, the celebration of Sri Krishna's birth and one of the major festivals of the Hindu community, was celebrated on Sunday (Sep 2) in Bangladesh. The day was a public holiday. In separate messages, President Md. Abdul Hamid and Prime Minister Sheikh Hasina greeted members of the Hindu community on the occasion of Janmashtami, local media reports said. National dailies published special articles while Bangladesh Betar, Bangladesh Television, private TV channels and radio stations aired special programmes highlighting different aspects of the eventful life of Sri Krishna. The Mohanagar Sarbojonin Puja Committee started a two-day programme at the Dhakeshwari National Temple to mark the festival. A colourful Janmashtami procession was brought out in the afternoon from the temple; it ended at Bahadur Shah Park after parading different city streets. 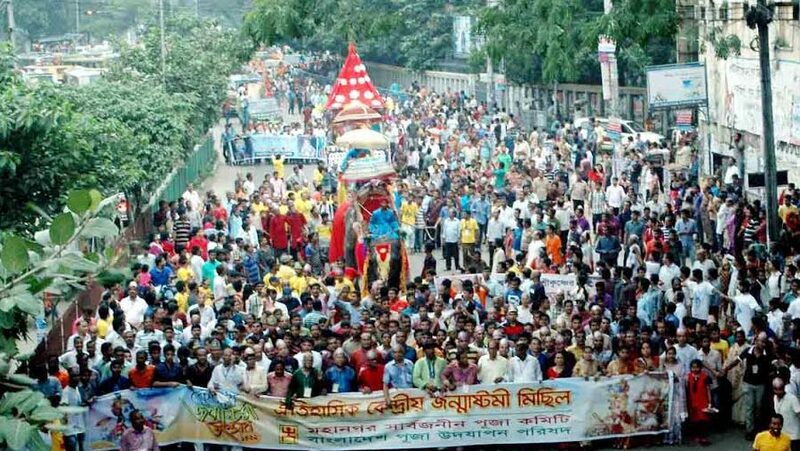 Dhaka South City Corporation Mayor Sayeed Khokan inaugurated the Janmashtami procession with Puja Committee President Shoilendra Majumdar in the chair. As part of the programme, a discussion and cultural event will be held at Dhakeshwari Temple today. The birth festival of Sri Krishna was also celebrated through similar programmes in different districts across the country.